We know you don’t want to think about cooler nights, especially when summer hasn’t even arrived yet, but have you ever thought about how to add a pool fire feature this summer to allow you to use the pool longer this season? A poolside fire feature is both aesthetically appealing and provides warmth. In many areas of the country, even if you can’t swim year round, you can sit outdoors in your pool area and enjoy the sights and sounds of nature while you’re snuggled in around a poolside fire feature. Talk with your swimming pool contractor from the best pool builder in Champaign, Illinois when they pay a service visit and ask about a fireside feature for your pool. 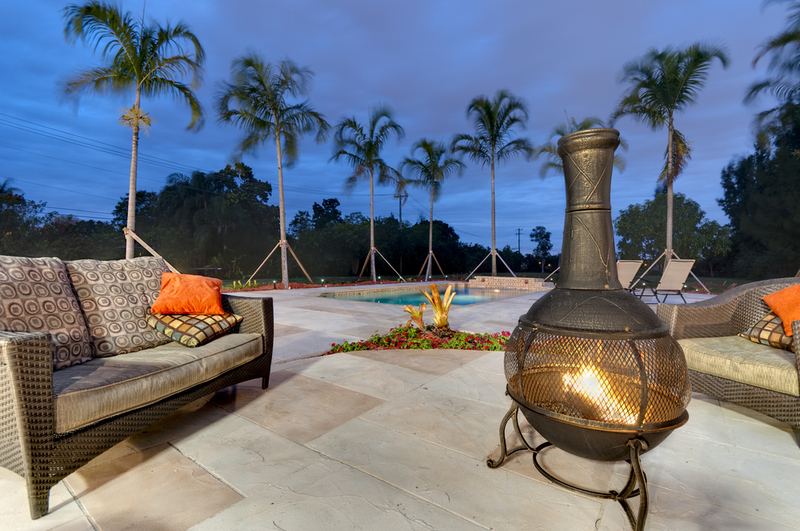 A fire feature is a popular poolside addition. You can choose from a wood burning, pellet burning, gas or natural propane style. No matter which style you opt for you will want to take steps to keep it as safe as possible. This may require building a masonry slab upon which to place the fire feature. A fireplace. This, as well as the other fire features, can be the focal point to your pool area. A fireplace will be designed to complement the layout and design of your poolside landscaping. You can opt to buy a pre-fabricated fireplace or have a mason construct one for you onsite. A fire pit. Fire pits are one of the most common fire features for pool owners. They can be three feet wide, or wider and you can have your fire pit be round, oblong, rectangle or square. When you choose a fire pit you can also choose your fuel source — natural gas, propane or wood. The beauty of a firepit is that you can gather many friends and family around it because it emanates heat from all sides. You could opt for a fire wall. This is what it sounds like — a wall from which fire and flames come. It isn’t as conducive to sitting around roasting marshmallows and talking with friends, but it can heat an area and make spending time out of doors in the cooler weather possible. If you’re not sure you want to make a major investment in a fire feature, consider a table fire pit — these are efficient and easy to assemble and will let you see whether a full fledged fire pit makes sense for your family.